Paul Tenorio makes necklaces of handmade fine heishi which are simply sumptuous. They are perfectly strung, both in terms of their patterns and in looseness on the string which makes for perfect hang. 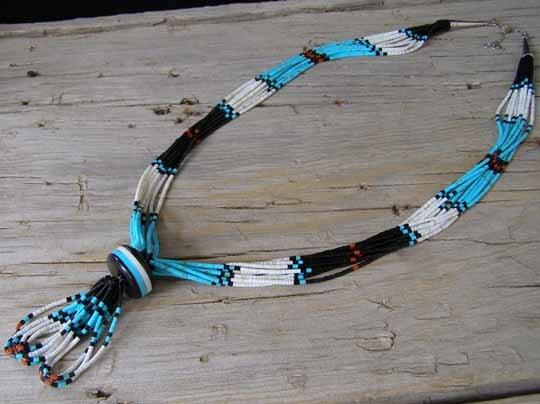 This ten-strand, full-length necklace is strung with handmade fine-diameter heishi of Kingman turquoise, white clam shell, Mediterranean red coral and jet. This is excellent work by a master craftsman. The necklace is finished at the catch with Sterling cones and includes a two-inch extension chain to adjust the length. This is a special version of Paul's classic fine-diameter heishi necklaces which includes a layered, laminated bead in front made from Kingman turquoise, jet and white clam shell. Hanging below this large, handmade bead are ten loops of fine heishi which reiterate the colors of the necklace in jocla loops.